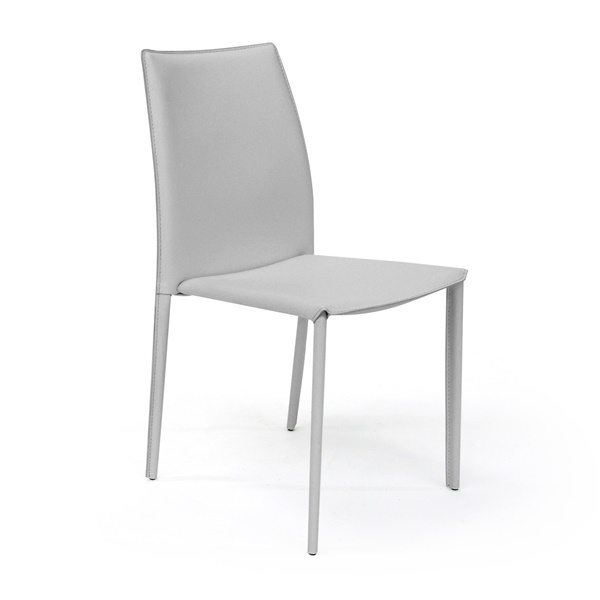 There is a visual delicacy to the Manta Leather Stacking Chair that makes this modern dining chair quite elegant. Its slim outlines, the crisp corners and quiet curves, are handsomely accentuated by the smooth, bonded leather that clothes the modern side chair from head to foot. The steel frame beneath is sturdy for all its delicate proportions. Love that they are entirely upholstered and stackable - sooo convenient, functional and attractive! Making the transition from traditional design to modern design throughout my home - it's slow going but it's shaping up nicely, these chairs were the first buy in transforming my dining room, they are versatile enough to look good with the current setting but will go even better with the other furnishings i'll be ordering soon! Totally digging the full leather upholstery and high back! They look awesome! Thanks! Purchased 8 of these online. Arrived 2-3 days later and am very pleased. Only suggestion here is that perhaps the color description could be more detailed rather than simply "brown". They are comfortable, perfectly sized, well made and they stack. I have an antique 1700 English trestle based table in my 300 year old farmhouse and they complement it perfectly. I was so happy to find a more sophisticated-looking stacking chair. The leather gives it a little extra comfort and elegance especially for holidays when we are hosting many guests. I purchased 8! Thinking of ordering a few more. Priced great and easy to clean. Very happy with my purchase. Really content to have a set of these in my home. When the extra family members aren't around I can store them in the closet too. I purchased these because the price was good and they were exactly what I was looking for in my space. They shipped really fast and I was so excited to receive them. I got them and when I put them at my kitchen table I was thrilled with the look. I was also happy with the quality of the chairs. They're perfect! Thanks Inmod! ProsSimple shape and upholstery. Great price and would definitely recommend. What is the weight capacity for each chair? The Weight Capacity for the Manta Leather Stacking Chairs is 250 lbs. The Manta Leather Stacking Chair is upholstered in Bonded Leather. Are these sturdy? Are they comfortable? Have these scratched hardwood floors? Do they look like they stack? I don't want them to look cheap! Thoughts? The Manta Leather Stacking Chair is an incredibly sturdy chair, that is rated for both residential and commercial use. It is upholstered in real leather, for a smooth, sleek look and feel. This is a comfortable option that has been used to furnish many hotel and restaurant settings. The feet have caps on them to help protect against scratching wood floors. The chairs are made to stack. is it 109 for 4 or 1? Each chair is priced at $109 and they have to be ordered in increments of 4.